In an exclusive partnership with The Pat Summitt Leadership Group, Orange Mountain Designs, a retail and online store based in Maryville will distribute Quotes from the Summitt, a new book about the late Pat Summitt that features some never-before-seen photos and the timeless words of the iconic Tennessee Lady Vols basketball coach. The 128-page hardback book, which costs $18.95, is available now online at orangemountaindesigns.com and is available in-store. Orange Mountain Designs is located in Maryville at Foothills Mall. The book, Quotes from the Summitt, is part of the publishing arm of the Pat Summitt Leadership Group and features previously unpublished photos of Summitt from her family and other sources. The content includes multiple entries in Summitt’s distinctive handwriting, a rare feature in traditional quotation books. The book is a spirited collection of quotes and advice from Summitt, who won 1,098 games and eight national championships, earned the title of NCAA “Coach of the Century” and graduated 100 percent of her players who completed their eligibility at Tennessee. Started originally by Summitt’s son, Tyler Summitt, to extend the legacy and leadership wisdom of his late mother, the Pat Summitt Leadership Group was formed in 2017. As well as reaching out to business-building and branding experts to create, develop and manage the group, which is based in Atlanta, Tyler Summitt also approached Holder, a longtime Summitt family friend and retailer, about becoming the group’s retail partner. 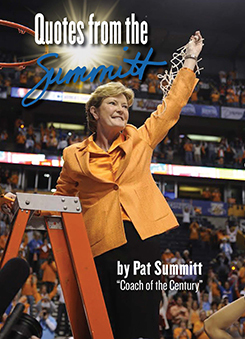 The Pat Summitt Leadership Group and Orange Mountain Designs forged a dynamic partnership to market and distribute this book, as well as other products. The Pat Summitt Leadership Group uses the wisdom and teachings of the legendary coach to promote leadership excellence through education and inspiration with a special focus on girls and women. The group provides speakers, seminars across the country, an online leadership program and more. Members of its executive advisory council include Robin Roberts of ABC’s “Good Morning America” and Joan Cronan, athletics director emeritus at the University of Tennessee. Orange Mountain Designs also displays memorabilia from Pat Summitt’s career, including championship rings, basketballs, Summitt’s Arthur Ashe Courage Award trophy from the ESPYs in 2012, the blue outfit Summitt wore to accept the award in Los Angeles, letters and other correspondence, and rare photographs. In 2011, Summitt was diagnosed with early onset dementia. She coached her last season for the Lady Vols in 2011-12 and stepped down in April 2012. Summitt died June 28, 2016. She published three books before her death with co-writer Sally Jenkins: Reach for the Summit, Raise the Roof and Sum it Up. Jenkins also is on the advisory council for the Pat Summitt Leadership Group. Mickie DeMoss, who served as an assistant coach for Summitt for 20 years, including Summitt’s final season, wrote the foreword for the new book. Early praise for Quotes from the Summitt has come from James A. Haslam II, the founder and chairman of Pilot Flying J; Roy Williams, the head coach of the men’s basketball team at North Carolina; and Ken Blanchard, leadership guru and author of more than 60 books including The One Minute Manager. Orange Mountain Designs, located in Foothills Mall in Maryville, Tennessee, is an officially licensed retailer for the University of Tennessee and the exclusive retailer for the Pat Summitt Leadership Group. At the behest of Pat Summitt, Orange Mountain Designs was established in 2008 by Terri Holder, a native of East Tennessee and longtime Lady Vol advocate. The store specializes in Lady Vol apparel and gear and also features historical items from the late Pat Summitt’s career, including championship rings, basketballs, Summitt’s ESPY Award trophy in 2012 and rare photographs. Visit orangemountaindesigns.com for more information. The store is open Monday-Saturday, from 10 a.m.-8 p.m. The Pat Summitt Leadership Group uses the wisdom and teachings of Pat Summitt to teach leadership excellence. The group provides speakers and resources with a focus on empowering women and girls in all venues and is committed to protecting and honoring Summitt’s values and philosophies. The Pat Summitt Leadership Group has three lines of business – publication, education and training, and film – and is a supporter of The Pat Summitt Foundation. Visit PatSummittLeadershipGroup.com for more information.